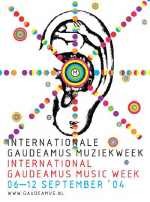 Gaudeamus Foundation is many things to contemporary music, its biennial newsletter indispensable to know what is happening throughout Europe and world-wide (mailing list or on the internet), its vast collection of scores and recordings a resource for everything you could want to know about Dutch composers. The annual Gaudeamus Week (click for the whole programme) is an international gathering of young composers of all stylistic persuasions and interests from every continent; a good opportunity to experience the current Babel of musical languages, socially advantageous for Britons because English is the lingua franca employed for networking and academic sessions; the comprehensive programme book is in Dutch and English. This year 17 works were shortlisted from some 500 scores submitted for the prestigious Gaudeamus Prize; commission of a piece for the following year's Week. With such stylistic diversity jostling for attention, choosing the winner (Sampo Haapamäki's Signature) must have been a daunting task for the jury. This report of our 3½ days in Amsterdam has to be subjective and will concentrate upon the music and events which had an irresistible impact and especially those pieces which 'spoke' to one or other of us with a memorable personal appeal. In 2001 our introduction to Amsterdam 's International Gaudeamus Music Week had been spectacular; entering a darkened space filled with goldfish swimming in plastic bags, a pianist playing an amplified piano amongst them (see pictures). This year we were greeted for The Night of the Unexpected by harpsichordist Anne Faulborn high above us, suspended from the ceiling of the Paradiso foyer to play a mixture of music old and new whilst floating in the air. The point of her carefully organised programme of miniatures, some of them specially commissioned one-minute items, was lost in the hubbub of the crowd waiting for the doors to the auditorium to open. Eventually we were allowed into the hall, to find the floor space mostly taken up with equipment for the evening's novelties. Our critical faculties were pulverised into passivity by the interminable Workers' Union Hoketus of Louis Andriessen, a purposely ' dissonant, aggressive symphonic movement for any loud group of instruments', these here split either side of the ambulant audience, their leaders signalling over our heads changes to the repetitive patterns. In a way, it mimics the hypnotic, noisy and relentless onslaught of contemporary urban life. Qualities required: insensitivity to noise and submission to mind-dulling rhythmic unison - in a few more years the Hoketus will probably be played even louder, by which time participants will have succumbed to inevitable hearing loss from pursuing their hobby, if not brain-death! There were Nancarrow Studies for Player Piano, a spectacular laser show (have the health hazards of these been eliminated?) and a political music-theatre tract (in Dutch) for an actor, with other characters represented by mobile loud speakers; and much besides - the whole evening a slick sequence of experimental offerings for visitors invited to ' submerge themselves in a mix of performances, video screens and sound installations '. The Icebreaker on the bank of the Amstel is the social hub of the festival, a delightful place to spend time eating, drinking and attending free lunchtime concerts and workshops which were for us the most rewarding events. The back room behind the café was adapted as a small hall for contemporary music by the owner Jan Wolff, a horn player namesake of mine. The Crash Ensemble from Ireland made a big impact there; David Lang with his Cheating, lying, stealing challenged the emotional and 'brainy' pretensions of young contemporary composers setting out their stalls, and he opts for an introspective piece to show the dark underside, 'ominous funk' . 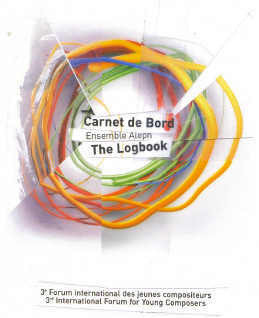 The broken ensemble is conducted with a hammer and the two percussionists maintain components changing rhythms on industrial iron components, amplification helping cello and bass clarinet to cut through a percussive background. Peter Adriaansz's Triple Concerto sports an unusually honest and illuminating note explaining its genesis and changes of direction; slow music played fast, a deception abetted by rapid tremolos, trills and ostinati. An interesting, arresting piece needing to be heard repeatedly to reveal its secrets - that in contrast to Zack Browning's absorbingly entertaining Network Slammer for flute (Susan Doyle) and tape. Zack's piece is direct and clear on first acquaintance, but one to hear again and again for the sheer pleasure of familiarity; based on The Magic Square of Venus (Agrippa), but nothing like Maxwell Davies - an electroacoustic work to wake up and delight the audience for any type of concert. After a snack lunch, back for more flute; a workshop by Ictus flutist Mike Schmid on his researches into multiphonics - they were discovered in the 19 C but quickly vanished; rediscovered in the mid-20 C, yet never established in flute repertoire as more than an occasional 'effects' novelty. Apparently 2,000 multiphonic possibilities are known out of a theoretically possible 100,000! Those explored extensively by Sciarrino are often jeopardised in live performance by the instability resulting from some of the alternative fingerings. The literature about these is out of date, and Schmid is launching a website to consolidate and validate the best fingerings for more stable results, with a new system for notating them. Composer Fabio Nieder joined Mike Schmid to illustrate the talk from one of his own compositions which uses multiphonics as an integral component (Rivo Alto CRR 2009). A related research was discussed in Taayuki Rai's Composers Workshop , a much valued, privileged opportunity to listen with young composers discussing their new scores in the presence of anyone sufficiently recovered from the previous night's music to turn out to the Gaudeamus office at 10 a.m. Olli Virtaperko and Louis Aguirre expounded the theory behind their works for organ to be heard later that day in Westerkerk, and Henry Vega his sampling and deconstruction of a fragment of Japanese text. Evis Sammoutis described his elucidation of the overtones produced on violin strings by six levels of bow pressure, notated with a clarity and practicality which impressed the group. It has opened for him ' so many direction possibilities each day'. These were realised convincingly by Lydia Forbes and Heleen Hulst in the world premiere of his magical work Dimorphism , inscribed In memoriam Giacinto Scelsi , music which the great master would have been proud to acknowledge in the succession of discoveries following his own that 'an entire universe of harmonies can be heard in a single sound'. In my book, Dimorphism had been a strong contender for the annual Gaudeamus Prize, for which it had been short-listed, and its potential should appeal to a world class contemporary violin duo - Irvine Arditti and Mieko Kanno might be interested? (Their performance together of Dillon's Traumwerk for two violins late night at Huddersfield was entrancing (Traumwerk is recorded on MO 782046). Ensemble Aleph brought us the fruits of their 3rd International Forum for Young Composers (under 40), a biennial enterprise which disseminates widely up to a dozen new works for their unusual line-up of seven versatile musicians - Soprano; Clarinets; Trumpets/Alp horn/didgeridoo; Violin; Cello; Piano/accordion/synthesiser; Percussion. Some one hundred scores had been submitted, most of them played through and argued over. The eleven finally selected 'aiming to retain a diversity that corresponds to the ensemble's own pluralism' were given at The Icebreaker. This concert, its two halves before and after a lunch break, was one of the best new music events I have ever attended, and unique for its Logbook, a lavish 150-page presentation with composer interviews and photocollages, and a CD of all the music, distributed free of charge to the audiences of the concerts, to the students participating in the various actions of training, and available for consultation in contemporary music Resource Centres. The standard was so high that it would be invidious to cite preferences; better just to list the names of 11 composers to watch out for again - Cecilia Arditto, Sebastien Beranger, Adina Dumitrescu, Carlo Forlivesi, Dmitri Kourliandski, Artur Kroschel, Gabriel Pareyon, Javier Torres Maldonado, Mayke Nas, Valery Voronov & Amy Williams. New music in Amsterdam attracts large audiences, and our first concert was sold out, gratifying for composers who had travelled far and crossed oceans to attend. Beurs van Berlage is a curious arts complex in the centre of tourist Amsterdam, a 1926 architectural masterpiece. The enviable Amvest Zaal, a futuristic state of the art conversion is built inside the smaller auditorium, the music given in a glass cube fully equipped as an electracoustic studio; outside this glass core is a spacious area for refreshments and socialising. For Chilean Oscar Carmona's Cygnus X-1, Nora Mulder's piano was festooned with microphones. The piece was based on a deep B which 'attracts and devours hopelessly increasing small elements gathered around a D, sucking them into the Black Hole' . It was good to hear again Aaron Cassidy's intricate Ten monophonic miniatures, inspired by Ian Pace's research into 'the importance of key noise as a pivotal parameter throughout the piano repertoire'. This employs amplification to render audible 'a variety of muting techniques which create unpredictable results'; they had been more effectively demonstrated by Pace, and experienced by the composer and an all too small audience of devotees, at St Cyprian's, London, together with Cassidy's metallic dust (Ian Pace& Carl Rosman). At the interval Nora Mulder's piano disappeared down a deep hole which opened on the stage. I could not warm to the longest work, Norwegian Elvind Buene's 25 min 'deliberately disordered' and abrasive Anatomic Notebook, its guiding principle 'the chaos, superimpositions and interruptions of life'. A more positive impression remains of Romain Bischoff's Nederlands Vocal Labaratorium , eight virtuoso singers who exploited the possibilities of up-to-the-minute technology. Their offering I'd most like to hear again was Idoru in metal by Henry Vega (USA), who is dedicated to the creation and promotion of electro-acoustic music; the three female singers creating 'an idolized computer-programmed singer, whose imaginary capabilities are infinite' . Great sounds, and splendid dissemination of them in Amvest Zaal. Sampo Haapamäki's prizewinning Signature featured in the Radio Kamerorkest's concert at Beurs van Berlage, and truth to tell it would not have entered into our own 'short list' of potential winners. Indeed we found that concert a dispiriting event, with the orchestra on the high platform of the huge, unfilled Yakult Zaal, leaving us wondering whether trying to prop up the traditional symphony orchestra for contemporary music is a lost cause? Anthony Pateras's uncompromising Twitch was notable for the accomplishment of the group from Melbourne which had travelled such a long way to play it - a "Lachenmann-prestissimmo" virtuosic race by 'found' percussion, de-natured trombone, contrabass recorder, and violin (smashed at the end; sensitive souls mollified, only just, by learning that it had been a cheap Chinese instrument). There was an ongoing exchange of promo and other CDs, and some welcome receipts included electroacoustic music by Henry Vega from UK Radio 3's Hear & Now, Olli Virtaperko's baroque intrument group Ensemble Ambrosius and, from MuziekGroep Nederland, a sampler of 27 Nederlands composers (NM Special 93007 ), and looking ears complete, a boxed collection of recordings of electronic music for tape, with and without instruments, by the Dutch pioneer, Ton Bruynèl (1934-98) launched as a memorial tribute during our last day in Amsterdam. Rain, with four pianists at two pianos, was played in our last concert, an evocation of nature transformed into sparkling textures, dense knots soaring into the stratosphere and resolving into earthly watery sounds. You can hear it (actually sounding rather better than live !) played by the Dutch Pianists' Quartet on the fourth of the CDs in that set (CV NEAR 12).